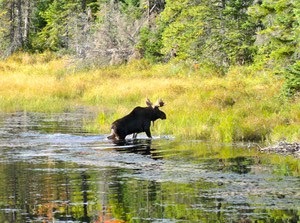 Every year during summer and fall months thousands of visitors flock to Algonquin Park - one of Canada’s oldest and most popular outdoor venues to enjoy a myriad of sights, sounds and activities. Its unique appeal stems from the fact that for over 100 years the Park management plan has focussed on preserving the Park’s pristine environment. For example, each year the scope of logging operations diminishes in the park, motorized vehicles are permitted only on the Highway 60 corridor and hunting and fishing activities are strictly controlled. Algonquin is diverse and offers something for nearly everyone. Many visitors spend up to a week or more canoeing, camping, hiking and exploring the 7,653 square kilometres of Park wilderness. Accommodations in and around the Park include campgrounds, motels, guesthouses, inns and bed and breakfast establishments - the latter existing in small numbers. Prospective visitors, especially overseas travellers, begin planning their Park visit early, typically in February and March. Last month 83% of The Deakins’ February Trip Advisor inquiries were for trips being planned for April or later of this year. The Deakins on Mountaivniew Bed and Breakfast enjoys a unique location in that it is situated equidistant by highway from both Algonquin Park entrances. The Deakins is a destination and experiential B & B. Guests can learn about the culture and history of the maple syrup industry by taking part in a guided tour of the Ontario Managed Forest as well as workshops that include tree planting and making maple products. And what about the traditional breakfast of local sausages and French toast with maple syrup and orange zest? Prospective holidayers to the area will find more useful and engaging information on our website www.deakinbandb.com as well as on the very popular Friends of Algonquin Park site which is maintained daily. Whether you are staying overnight or longer, The Deakins are delighted to assist you in planning a full itinerary of experiences and lasting memories of your visit to Algonquin Park.